Today is Sunday.... I actually feel pretty awful... I'm missing my great nephews (Vincent) birthday party.... so while I'm trying to get rid of this headache, cough and icky nose... I've decided to sit at the computer and get some work done. 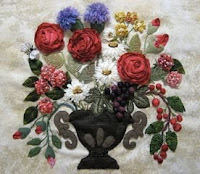 I've just talked with Jan Vaine...this is the class she will be teaching in January 2010. It's called Fancy Flowers.... more will come in an email and on our website. Keep watching your email for more news! Cruisin' - yep... we're putting together our list of "cruisers" so we can begin to give them fun information regarding our cruise in December!! I'm so excited... I've never been on a cruise before ... so to go on one with 40 - 45 other gals is going to be too much fun! Mara (my cruise director) is an awesome lady and has been on over 65 cruises.....WOW!!! So... if you're going with us... you'll be hearing from us soon!!! Bucket List - I've finished one of my items on my bucket list... well, it's not actually finished...but I'm well on my way! I can't tell you all of it at this time.... but I'm sooooo excited about it.... tell you more later!! Our Web Sampler quilt is finished.....yippee!!!! Here is a sneak peak of it .... if you go to our website and click on the Web Sampler logo (star in a circle) it will take you to a full picture. Plus you'll be able to see all of the other blocks. Go to each web site and purchase your block...while you're on each site, take a peak of their quilt finishing kit. Buy the one you want... and you'll be ready to go! It all begins on Sept. 15. I've just finished putting the binding on my "Same But Different" quilt. It's so "fall"... I love it. I wish I had a picture to show you....but not yet. We'll be taking it to the Philadelphia show (we leave next week) so I'll be sure and take some pictures to show all of you. I'm now off to the living room.... cuddling in my chair... and hand sewing my binding down.